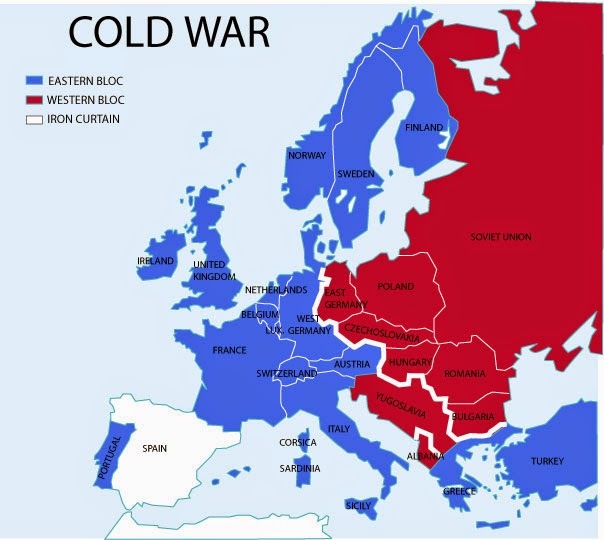 Above is a quick animation showing the course of the Cold War. This fellow rudthespud likes to post his own little summaries of world history. While his choice of material is broad, it isn't really comprehensive, so don't throw away your textbooks just yet. However, it should give you a feel for all the buzzwords you need to pass just about any test on the subject he covers. It might also fill a gap in your knowledge here and there - did you know what year NATO was formed? The Warsaw Pact? Find out by watching the video. He also makes a real mistake here and there - mis-spelling 'détente,' for example - but that just shows how difficult these things are to put together. This animation covers the post-war period, which was the beginning of the nuclear era. This period devolved from a forced alliance between the Soviet Union and the western powers into armed neutrality. Neither side was too excited about continuing the relationship past the common goal of defeating the Axis powers, and thus was born the Cold War. These history animations are of interest to history buffs. I previously have posted history videos about World War I and World War II, among other topics. These also allow me to pad the index with all sorts of important names and events, so it's all good. Anyway, you probably know everything that's in the animation, but it is quick and bouncy and the animation is fun. The animation was made by Manny Man and narrated by John D Ruddy.